How Do I Choose What To Buy? 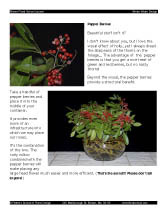 This link will give you a Free PDF Catalog of All of Our Distance Floral Art "how-to-do-its"!!!! You can download this free catalog and read a detailed description of all of our available distance education resources when you are offline. But here is an idea to help make your selection choice even easier! For your convenience we have summarized below nineteen different categories of designs. Click on each of the categories, and you will download a pdf document listing all the titles that fit into that category.... ENJOY!! 1. Designs may fit into more than one category. 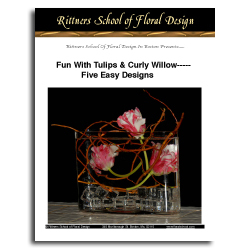 For example the "Fun With Tuips and Curly Willow" floral digital cookbook at the right features instruction in five easy designs in a water base. This could be listed both under "Water Based Designs" and also "Extremely Easy Designs." A huge number of designs from many of the other categories could also be used for "Weddings," etc. There is no minimum number of "how-to-do-its" that you 'have' to buy. You may buy as many as you’d like. Because of the inexpensive cost of these instructional materials, it is easy to buy three or four to start with just to see what they are like. Nor is there any specific sequence that you 'have' to follow. They may be enjoyed in any order! Remember. These are not a diploma course. They are like having digital floral design cookbooks! 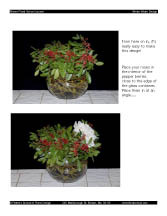 Rittners Floral School Distance Education.....Best described as huge numbers of pictures showing step-by-step how to make all kinds of neat floral art, along with detailed instruction. 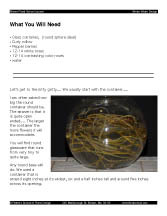 They are easy to download..and easy to access on both Windows and Mac computers...Over seventy-five titles now available featuring collectively over one hundred floral designs.....Step-by-step, world class floral art instruction. Tons of pictures....Inexpensive. Enjoyable. Available to you at any time of day or night at the click of a button! (After you pay for them of course!) And they are only $12.50 per "how-to-do-it." That's right........$12.50.......... A really great deal!!! Smiling. You can't go wrong at that price!! 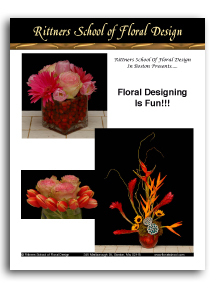 It is no wonder that many people say...."If you really want to learn floral designing.... Go to Rittners Floral School in Boston...."